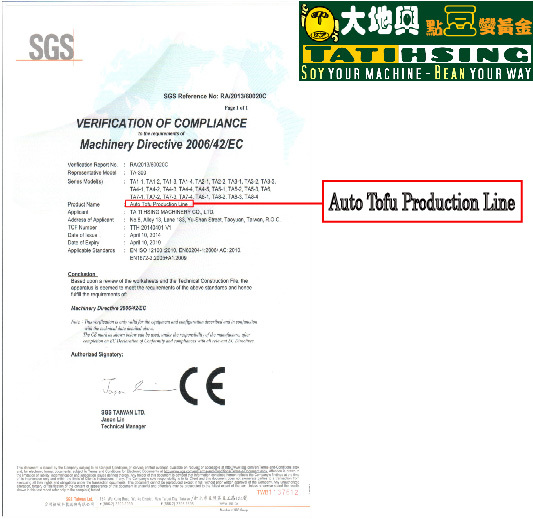 Our auto tofu machine production line obtained CE certification. From soaking & washing, grinding, cooking, filtering, curding, pressing, cutting, to pasteurizing. The whole production equipment are strictly compliant with SGS test. For our mission is to provide high quality, safety and sanitary machinery to our customers. TaTiHsing sincerely hope to build up business relationships with all our esteemed customers from around the world for our best service. We do believe our good service will be word of mouth with our customers.